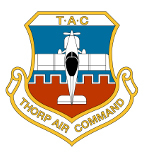 Thorp Air Command - T18.net • View topic - Can wide body Thorps carry more fuel? Can wide body Thorps carry more fuel? Post subject: Can wide body Thorps carry more fuel? It seems that whether a discussion is about a standard or wide body Thorp fuselage, the standard 29 gallon tank is used. Wanted to know if the 2" width increase in the wide fuselage models translates into a 2" width increase for the fuel tank, thereby offering a little more fuel capacity? Post subject: Re: Can wide body Thorps carry more fuel? The firewall is the same in both models. The width increase is at cockpit rails. The tank area is virtually the same, so the same tank is used. See Dave Read's mod for more fuel. He increased the "belly" of the tank for more vvolume. As Bob said I pooched out the radius portion of the tank somewhat without interfering with my toes. With modern avionics which are not as deep I also effectively pulled the tank away from the firewall 4". The combination gives a 40 gallon main tank.